For many years now, I have seen this sword displayed on the wall of my uncle’s house, but never quite bothered to ask its history or origin. 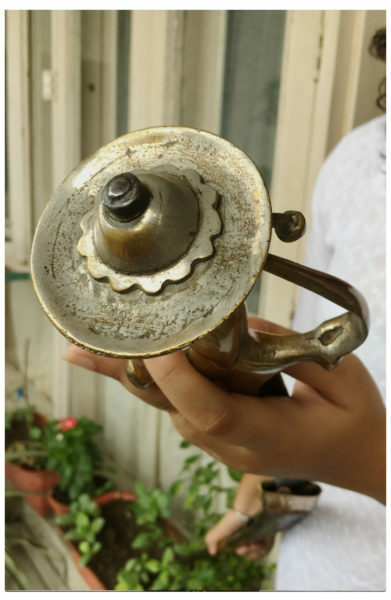 Then, one day, out of curiosity, I asked my family if we had anything from the ‘other side’, something that had been carried to India during the Partition. To my surprise, my uncle pointed to this very sword. At first I didn’t believe him, given his notorious and humorous nature, but when he narrated the story, it became clear that an important heirloom had been sitting in plain sight for all these years, without being valued or celebrated the way it should have. But truth be told, the story of this sword goes further back, to the year 1924. It once belonged to my maternal great-grandfather, Baljit Singh, born on April 4, 1904, who was affectionately called ‘Mian’ by his friends and family. 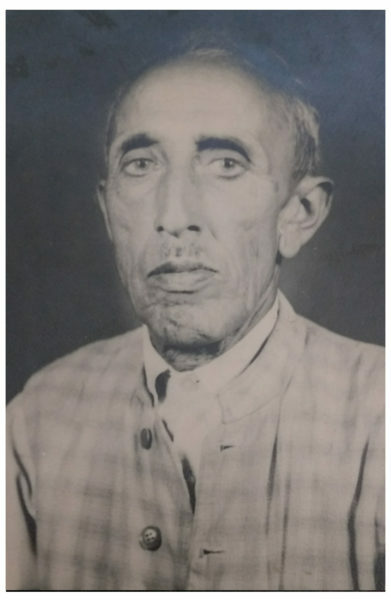 Baljit Singh was a student at D.A.V (Dayanand Anglo Vedic) College, Lahore, while the rest of his kin lived in a small village named Dattal near Palampur in Himachal Pradesh. As it so happens, after Partition, D.A.V College found a new home in Ambala and incidentally, on its premises in Lahore, was established the ‘Islamia College, Civil Lines’. 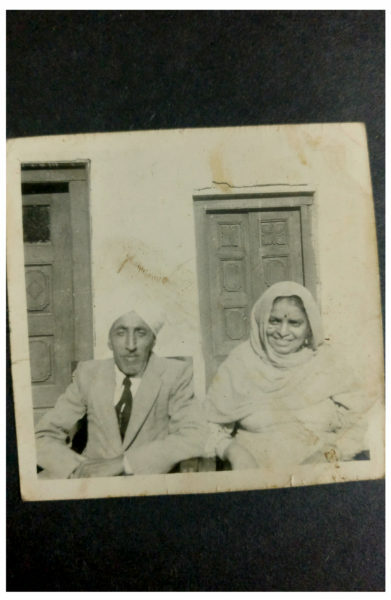 Baljit Singh had travelled for higher education to Lahore, as there was no college in Himachal Pradesh at the time. He completed his bachelor’s in English and was a teacher by profession. During his days in Lahore, communal tension began rising in the wake of an imminent independence and possible partitioning of the land. 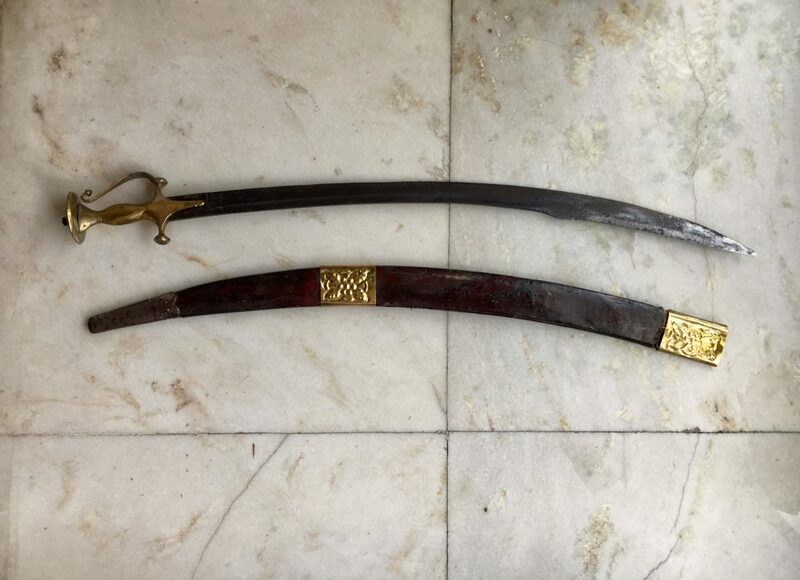 To protect himself, Mian Baljit Singh bought this sword. But apart from that, I believe that it was also considered as a symbol of status and style. 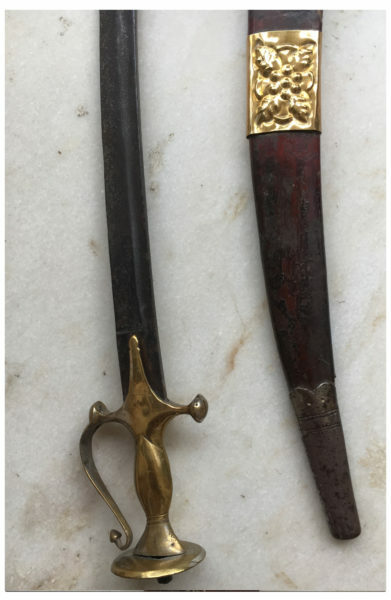 The talwar or sword has a curvature in the distal half of the steel blade, as opposed to the regular curvature nearer the hilt. 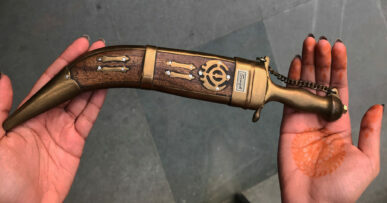 The blade of the talwar widen towards the tip. This increases the momentum of the distal portion of the blade when used to cut. 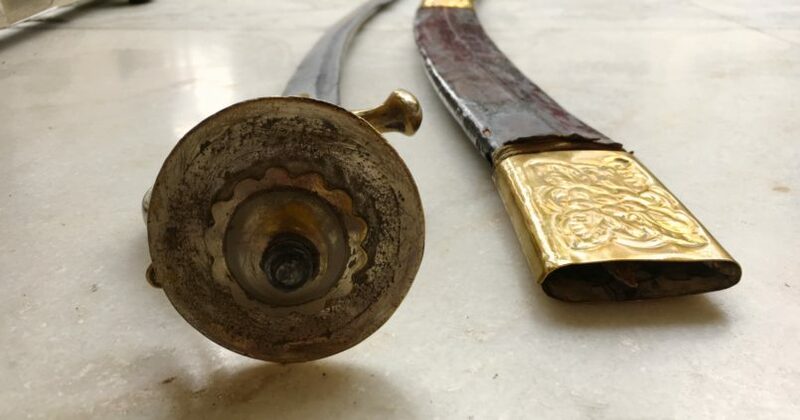 The hilt is entirely made of brass and is connected to the blade by a very powerful adhesive resin. 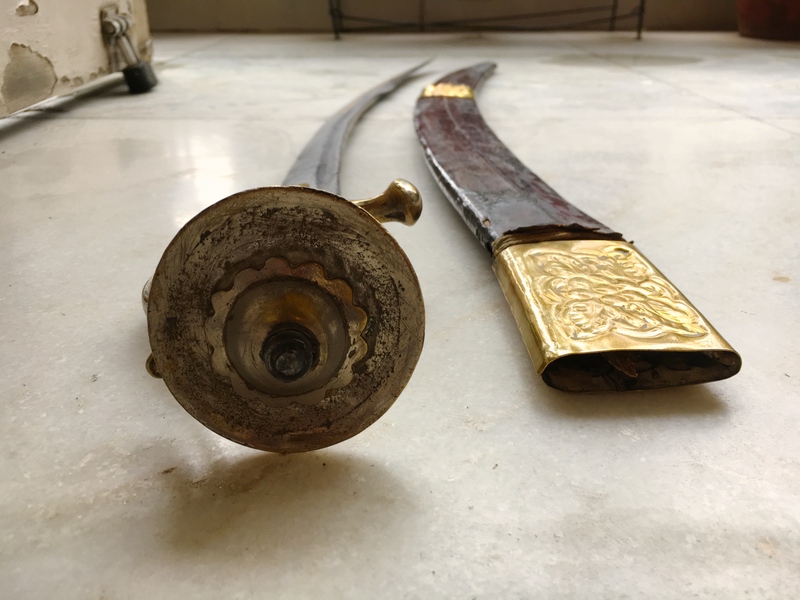 The hilt of talwar is termed as ‘Disc Hilt’ from the prominent disc-shaped flange surrounding the pommel, the enlarge fitting on the top of the handle. 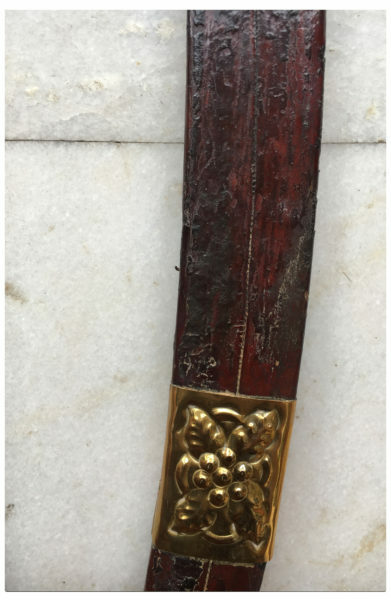 The scabbard or protective sheath is made of thin wood overlaid with leather and tip has metal mount. Together with the scabbard, it weights more than 12 kg and almost four feet long in length. The handle is made of pure brass and beautifully graved with design. Over time, it had oxidized and weathered greatly, its blade has grown blunt, and yet its glory has remained. Even today, it is as magnificent in shape and form. I wish I knew more about this object in relation to my great-grandfather’s life, I wish someone had asked him more about it. I wish someone had questioned the importance of this heirloom while he was still around. But as far as we know, he never had to use it, for he managed to come across the border safely during the Partition. Since then, worked mostly for the District Board Schools. Serving at several institutions through his life, he began his career with Zamindara Anglo Vedic High School, Sulah. He went on to District Government Middle School, Banjar, Kullu and then Government Middle School, Dhameta. Later, he joined government services and was moved from District Board to Government Board. Following that, he got transferred to Government Middle School, Gandar and then Government Middle School, Khera and then finally retired from Pahara in the year 1961. Unfortunately, he did not live a long life and died at the age of 68 on March 11, 1972. He was married to Sevati Devi and had two sons and two daughters namely Pushpa Devi, Arjun Singh, Kamla Devi and Karan Singh. But they all recall him as a strict man, who made sure to teach each of them the value of hard work. When not on the wall, it is often wrapped tightly and neatly in layers of newspaper to prevent it from further oxidizing. But as most items of age go, this sword holds great emotional value for my maternal grandfather, Col. (retd.) Arjun Singh Manhas. 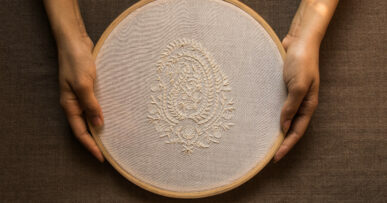 He inherited it from his father, and has further passed it down to his son, my uncle, who will perhaps continue the tradition down the lineage of his own family, adding to the rich history of this aged object. My compliment to Saundarya and Anchal for their thought, efforts and overall concept of revisiting our own family ancestries through antiques, which are close to our hearts and hold a poignant affection. Gaining such morality at such an early age teaches us to hold the value of the Accessories and Attitudes which are present around us today. Beautifully written. Message of valuing inheritance and understanding the history and emotions behind this. Very fascinating indeed . Now that you have started on a great journey, I am sure Soundarya you will explore many more such stories from the past . Keep sharing And Looking forward to your next write up . A very emotional and a superb article by Ms. Saundarya. We can find such stories somewhere hidden all across the country. Thank you so much, Minu. We strive to imbue history into the story of every object we post. Hope you enjoy browsing the Museum! Very well articulated n expressed.Grttt combination of many sentiments n intricate details. All in all a good write up. Keep it up …!!! Appreciate your eye for precision and beautiful writing style which truly compliments your name….. Saundarya!!! As they say, ‘The journey of a thousand miles begins with one step’ my compliments for taking that one step. Not even an iota of doubt regarding your successful career in the field of writing. All the Best! Great article guys! Way to go! Very impressive & detailed description of the Sword. An insightful article, well articulated & interwoven with emotions by Saundarya. A poignant reminder of being curious & observant to purchase surroundings. One never knows what a rich piece of history is in front of our eyes & we are completely oblivious of it. If not told it will be lost in the realm of time. Beautifully written and very descriptive article.Delighted to see keen interest of current generation in exploring the heritage of own ancestry…keep it up! Beautiful written and very descriptive article.Delighted to see keen interest of current generation in exploring the heritage of own ancestry. Way to go Saundarya….Keep it up!!! This is like a whif if fresh air, to see the youngsters interested in history!!!! Till one came across this good piece of work one had concluded that history has become history for the present generation!!! Very assuring for the older generations and motivating for the younger. Good work girls!!!! Very reassuring to see this write up. Great!!! Even though it is history it comes across as a whiff of fresh air as it is an effort from the youngsters!!! Very motivating for the present generation. A new perspective for speeding era to take a pause and see another angle. Keep up the good work girls!!!! !